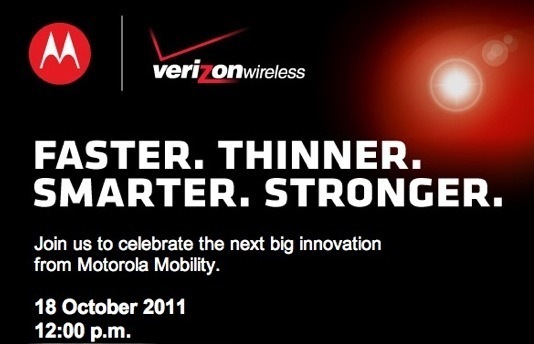 Motorola & Verizon Holding 18th October Event – Motorola Droid RAZR, Atrix 2 Or Xoom 2 Maybe? Motorola have announced in conjunction with Verizon Wireless an event that will promise to unveil “the next big innovation and all this will be coming to you on the Tuesday 18th of October 2011. It is not known what will be announced or what will be revealed, but the tagline reads “Faster. Thinner. Smarter. Stronger.”, This could well give it a strong hint towards the well known, iconic RAZR Branding and bring it to Android with a sleek new Smartphone. But, it might not well be the RAZR as it seems and many might think…. Motorola are also thought to be getting new tablet models ready for release and introduce new Xoom products to their range. They are rumoured to be introducing a new 10” style angular shaped model as well as a new to Motorola 7-8” model tablet. They are also expected to be on Verizon with the 4G LTE High speed network at their disposal. Don’t forget also the successor to Motorola’s flagship Atrix handset the Atrix 2 may be seeing an introduction soon so we can’t rule anything out and wish for that owe so alluring thought of a Droid RAZR just yet. Tuesday, October 18th Motorola and Verizon’s press event will reveal all and we will keep you filled in to as what the news is but until then just enjoy the video and speculate to what new cool devices we could be getting.